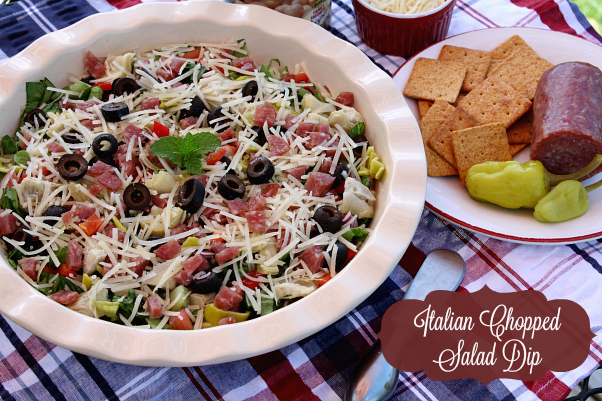 The inspiration for this easy layered Hummus dip comes from my favorite Italian Chopped Salad. Are you a Hummus lover? I'm definitely a lover of just about any hummus that you put in front of me. It's the perfect protein packed snack served with veggies, as a spread in a sandwich wrap, or by far my favorite is all dressed up with a variety of mouth watering toppings in a layered dip. I have to admit the first time I tasted hummus was until about 6 years ago. I was on a blogging trip and during one of our cooking sessions I was introduced to hummus and Falafels. I was familiar with hummus, but Falafels were new to me. All I can say is it was ♥ at first bite, and I've been indulging in its deliciousness ever since. I remember returning from my trip excited to try my hand at making my own hummus. I searched high and low for tahini (ground sesame seeds) with no luck. I eventually found it at a specialty store, but my hummus tasted nothing like what I enjoyed on my trip. I struggled with finding the perfect balance of flavors, so it turned out kind of bland. Over the years I've improved in my hummus making skills, but I just don't make it as often as I would like. Fast forward to today and insert Bush's® Hummus Made Easy! Just when I thought things couldn't get any easier, Bush's comes out with these Hummus making flavor pouches. Totally genius if you ask me. Each pouch is filled with the perfect blend of olive oil, tahini, garlic and lemon juice. 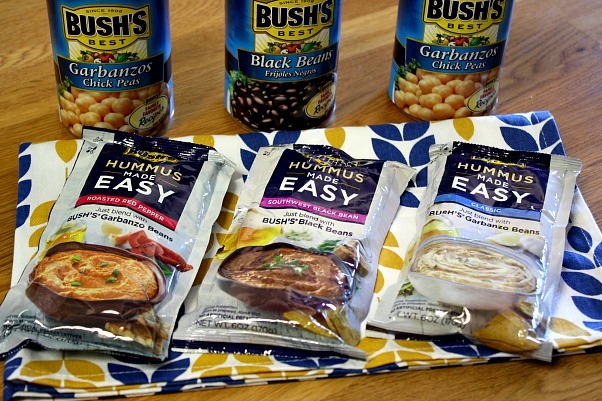 All you need is a can of drained Bush's Garbanzo or Black Beans, a pouch of Hummus Made Easy, and a blender or food processor. It's as easy as that to make a delicious homemade hummus. I love these new pouches and I'm happy to say that I'm back on the hummus making train again!!!! Hummus Made Easy comes in three varieties, Classic Hummus, Southwest Black Bean, and Roasted Red Pepper. You can use these flavor packets to make hummus or as a base to build your own recipe like I did when I made this yummy Italian Chopped Salad Dip. 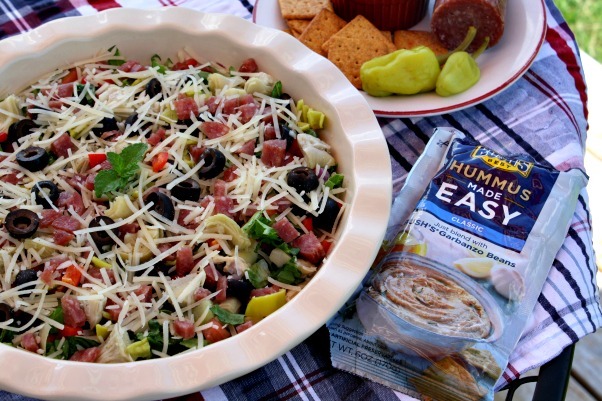 Italian chopped salad is one of my favorites, so I decided to use the Bush's Classic Hummus Made Easy for the base of my dip, and layered all my favorite salad ingredients on top. The best part about this layered dip is that everything is chopped small, so you get a lot of different flavors in every bite! Let's get started on the recipe. First drain and rinse one can of Garbanzo beans. Add the beans to a food processor or high speed blender. Add one packet of Bush's Classic Hummus Made Easy and blend until your desired consistency. Spread the hummus in an even layer in the bottom of an 8 or 9 inch pie plate or similar shallow dish. Add half of the following ingredients, Italian cheese, peperoncinis, black olives, chopped artichoke hearts, chopped onion and salami. Add the chopped romaine lettuce, tomatoes, bell peppers, and the remaining peperoncinis, black olives, artichoke hearts, onions, and salami. Sprinkle the remaining 1/2 cup of Italian cheese evenly over the top and season with a dash of salt and pepper. Drizzle a couple spoons of the reserved artichoke marinade evenly over the dip. If you do not want to use the artichoke marinade you can drizzle a bit of olive oil on top. 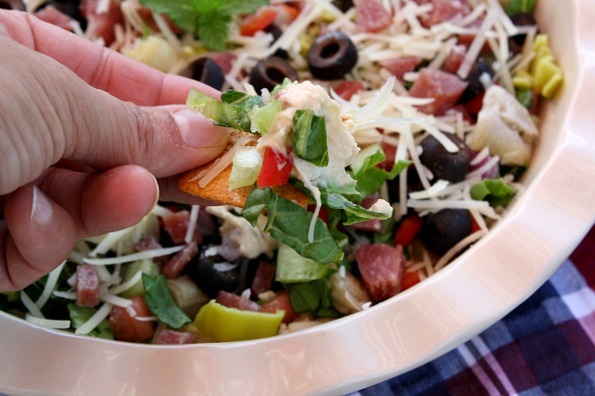 Serve immediately with pita chips or your favorite crackers. Refrigerate leftovers. Add drained and rinsed Garbanzo beans to a food processor or blender. Add one packet of Bush's Classic Hummus Made Easy and blend until desired consistency. Spread the hummus in a smooth even layer in the bottom of an 8 or 9 inch pie plate or similar shallow dish. Add half of the following ingredients, Italian cheese, peperoncinis, black olives, chopped artichoke hearts, onion and salami. 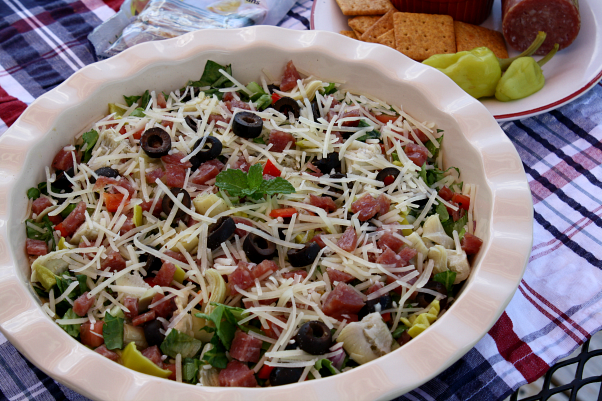 Add the chopped romaine lettuce, chopped tomatoes, bell peppers, and the remaining peperoncinis, black olives, artichoke hearts, onions, and salami. Top with the remaining 1/2 cup of Italian cheese and season with a dash of salt and pepper. Drizzle a couple spoons of the reserved artichoke heart marinade evenly over the dip. Serve immediately or refrigerate until ready to serve. Serve with pita chips or your favorite crackers. If you're looking for more recipe inspiration, stop by www.hummusmadeeasy.com for a variety of recipes. This looks FABULOUS for Lunches....thanks for the tip on Bush Humus Made easy...I'm sure it is better than store bought Humus! I'm going to make this salad dip and try my own with an Artichoke Dip Base another day. Great minds think ping together! This salad dip is making my mouth watery right now! It's perfect that you shared such a delightful recipe which I can't wait to prepare!